My name is Suthida Sakulsurarat, most people know me as Fon (It’s my nickname which means Rain in Thai). 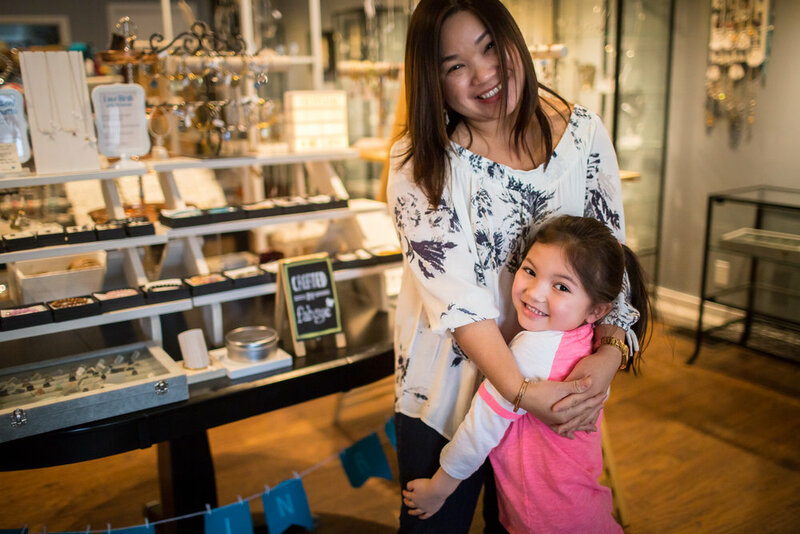 I am a proud mother of a 4 year old, wife, graphic designer, photographer and the owner of Fahsye, a jewelry, fashion accessories, and gift store located in North Winton Village. I am originally from Bangkok, Thailand where I received my Bachelor’s Degree in Photography before coming to the US for a Master’s Degree in Graphic Design from Rochester Institute of Technology. After I graduated from RIT, I started to work as an in-house graphic designer/photographer for a telecom company and then had an opportunity to work for a local design firm in downtown Rochester where I had learned to work in a business environment and gain some marketing experience. I wanted to be so many things – a cop, a zookeeper, a super hero but my dream job was to be a veterinarian before I realized it was more involved than playing and hanging out with animals all day long, so I decided that it probably wasn’t the right thing for me. The company I worked for was sold to a larger organization and many people got laid off during the process, including myself. It was the combination of that layoff along with a few that my husband experienced when we decided it was time to “do our own thing”. I had several relationships back in Thailand that I decided to capitalize on by starting an import boutique. The biggest challenge I faced is that I had little, as in no, retail experience. There was definitely a learning curve but one that I am happy I went through. It taught me a lot about business in general. When I hear the feedback from customers about how they found that perfect gift for someone special or when I see return customers it makes me realize that I have started something that is part of the community. It took a while to realize, but now being in business for over 5 years, I see so many familiar faces coming back again and again. Also, being my own boss now and not being limited to a certain number of weeks of vacation I get to go home to Thailand and that helps give me the stamina to keep plugging away. Family is very important to me and having the ability to see mine for such an extended period each year, and now having a child and wanting her to experience all that I grew up with, it makes all of the hardships that much easier to deal with. Make sure you LOVE what you are doing because being in business for yourself means you don’t get to “turn it off” at 5 pm and pick up again at 9 am. You will live, breathe, and be totally immersed in it. The line that my husband and I use is “the joy of being your own boss is that you get to choose the 80 hours a week you work”. It is totally true. The ability to create for a living. 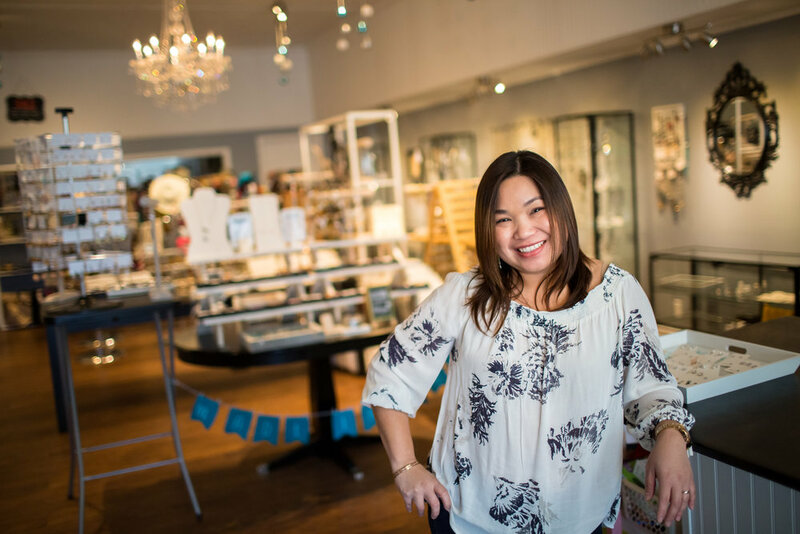 When I started out I focused on importing items from my native Thailand and as the years went on and I learned that people kept coming back to Fahsye because I was offering something they didn’t see in every other retailer it inspired me to start creating my own items. I am thankful and grateful that many of those items have become my best sellers. I continue to import but have found that the blend of my own creations allows me to keep things very fresh and unique to the Rochester community. The main thing is the interaction and the feeling of being a part of the community. Second is seeing the reaction to the products that I source and challenge of continually creating new products. Last is the fact that I am able to have my husband and daughter with me at work in these early years. When most families have to go their separate ways to earn a living we are able to spend time together. With my husband being a realtor, he works out of Fahsye most days unless he is running appointments. Getting our name out into the community. It makes me laugh when people come in and ask “This place is great, how long have you been here?” and I tell them 5 years. Sometimes they live right around the corner. It does demonstrate how large the economy is here which is a benefit to small business owners. David Demarte from David Lane Designs at the Hungerford: He makes custom watch straps and leather goods. My husband is a watch geek and has a had him make a few straps that are absolutely beautiful. Kim Best: She does beautiful hand lettering and we have featured her cards at Christmas time. Erika Sorbello from Gallery Salon : She is fabulous with hair and a wonderful person as well.